The objective of this work was investigate the synergistic, additive and antagonistic effects of fruit mixtures on total antioxidant capacities and bioactive compounds in tropical fruit juices, and optimize its formulation by the response surface methodology based on the responses: total polyphenols (TP), total antioxidant capacity (TAC), ascorbic acid content and sensorial acceptance. Camu-camu, acerola and acai were the major factors that influenced the antioxidant potential of the juice; and the yellow mombin showed a positive effect on the acceptance of the tropical juice. It was observed an antagonistic effect between acerola and camu-camu for the TAC response. The optimum formulation obtained was 20% acerola, 10% camu-camu, 10% yellow mombin, 10% cashew apple and 10% acai, which was responsible for a response of 155.46 mg.100 g-1 of ascorbic acid, 103.01 mg of GAE.100 g-1 of TP, 10.27 μM Trolox g-1 of TAC and approximately 6.1 of acceptance. Key words: Tropical fruit, total polyphenols, total antioxidant capacity, ascorbic acid, functional food. El objetivo de este trabajo fue investigar los efectos sinérgicos, aditivos y antagónicos de mezclas de diferentes frutas tropicales en la capacidad antioxidante total (TAC) y compuestos bioactivos presentes en los jugos mixtos, y optimizar su formulación por la metodología de superficie de respuesta basado en las evaluaciones de: polifenoles totales (TP), capacidad antioxidante total (TAC), contenido de ácido ascórbico y la aceptación sensorial. Camu-camu, acerola y acai fueron las frutas que más influyeron en el potencial antioxidante del jugo mixto; y el jobo mostró un efecto positivo en la aceptación del jugo mixto tropical. Se observó un efecto antagónico entre acerola y camu-camu para la TAC. La formulación óptima obtenida contenía 20% acerola, 10% de camu-camu, 10% el jobo, 10% de manzana de marañón y 10% de acai, la cual ha proporcionado contenidos medio de 155,46 mg.100 g-1 de ácido ascórbico, 103,01 mg de GAE.100 g-1 de TP, 10,27 mM Trolox g-1 de TAC y aproximadamente 6.1 de aceptación sensorial. Palabras clave: Frutas tropicales, polifenoles totales, capacidad antioxidante total, ácido ascórbico, alimento funcional. Department of Food Technology, Federal University of Ceara, Fortaleza, CE, Brazil. Embrapa Tropical Agroindustry, Fortaleza, CE, Brazil. In recent years there has been an increase in the availability of tropical fruit drinks with potential health benefits (1). Nutrient-rich beverages are gaining popularity due to the desire of consumers for healthy drinking while experiencing new and exotic flavors, and due to the focus of industries to produce beverages with the health claim as a parameter of differentiation (2). Tropical fruits are widely accepted by consumers and are important sources of antioxidant compounds. Among the tropical fruits, the acai (Euterpe oleracea) has significant anthocyanin content, lipids and fibers (3), gained popularity in North America and in the European countries lately as a new “super fruit” largely due to its extremely high antioxidant capacity. Camu-camu (Myrciaria dubia), acerola (Malpighia emarginata) and cashew apple (Anacardium occidentale) are recognized for its high vitamin C content (4, 5), being the camu-camu one of the richest sources of vitamin C ever studied (6). These fruits also represent a source of phenolic compounds that exert beneficial effects on human health since they have recognized antioxidant capacity. Moreover, yellow mombin (Spondias mombim) is very appreciated by Brazilian consumers due to its exotic and appreciated flavor besides its higher levels of phenolics and antioxidant compounds than the majority of fruits consumed (7). The natural combination of phytochemicals in fruits and vegetables is responsible for its potent antioxidant activity. There are ~8000 phytochemicals presents in whole foods, and these compounds differ in molecular size, polarity, and solubitlity. These differences may affect the bioavailability and distribution of each phytochemical in different macromolecules, subcellular organelles, cells, organs and tissues (8). For this reason, a combination of different foods, may exhibit additive, synergistic or antagonistic interactions among their different phytochemicals. Wang et al. (9) define the additive, synergistic and antagonistic effects in foods, were a food combination that provides the sum of the effects of the individual components is an additive effect; a synergistic effect occurs when the effect is greater than the sum of individual components, and antagonism occurs when the sum of the effects is less than the mathematical sum that would be predicted from individual components. To measure these interactions, a response surface methodology (RSM) could be applied. By definition, RSM is an empirical technique, which employs multiple regression analysis of the quantitative data obtained from properly designed experiments to simultaneously solve multivariate equations. The graphical representations of these equations are called a response surface contour that describes the cumulative interactions of the test variables on the response (10). The objective of the present study was to find a possible synergism, additive and antagonism effect among six tropical fruits (camu-camu, acerola, yellow mombin, cashew apple, mango and acai) and to establish the optimum concentrations of each fruit to obtain a juice with high levels of ascorbic acid, polyphenols (TP), total antioxidant capacity (TAC) and good acceptance using two-sequential statistical plannings (fractioned factorial design followed by response surface methodology). Camu-camu frozen pulp (Myrciaria dubia H. B. K. McVough) was purchased at the local market in Belém – Pará – Brazil. The frozen pulp of yellow mombin (Spondias mombin), mango (Mangifera indica L) and acai (Euterpe oleracea) was obtained from the local market in Fortaleza – Ceará - Brazil. The acerola fruit (Malpighia emarginata) and cashew apple (Anacardium occidentale L.) were harvested at Embrapa Tropical Agroindustry’s Pacajus Experimental Station, and processed to obtain the pulps. All the pulps were then frozen and stored at -18°C for further use in the experimental design. All the formulations were prepared according to the experimental designs, and after the addition of each pulp (independent variables of the planning). The formulations were completed to 50% with pineapple pulp (Ananas comosus), that represents the minimal level of fruit pulp required by IN 12/2003 (11) for tropical juice specification. Food grade sugar was added to standardize soluble solids content at 12° Brix. The bioactive compound concentrations that aimed to optimize in the juice formulations, were based on epidemiological studies and in relation to the antioxidant intake in the Mediterranean diet (MD), provided by Saura-Calixto & Goñi (12), in which these authors suggest a daily intake of 3500-5300 μM Trolox equivalent, as measured by the ABTS method. Ascorbic acid and total phenolic content (TP) were also evaluated as functional substances in the juices. Considering the low acceptance of some tropical juice due to their high acidity and specific taste, the sensorial acceptance was used as a dependent variable for the experimental planning. An integrated optimization strategy involving a combination of different designs was employed to optimize the contents of ascorbic acid, TP, TAC, and the acceptance of a tropical juice. The first design was to identify which variables were the most important for the increase of the bioactive compounds of the juice. Then, a full factorial design was used to optimize the concentration of these variables. For the screening of the variables, a fractional design (26-1) was used. The minimum, maximum and mean values for each pulp fruit were set at 0%, 15% and 30% (w/v), for camu-camu and acerola; and 0%, 5% and 10% (w/v) for acai, mango, yellow mombin and cashew apple. The levels were selected based on previous studies (unpublished results), and P < 0.10 were considered to be statistically significant. Based on the results of the fractional factorial design, a five-level (25) central composite design (CCD) was employed to optimize the values of ascorbic acid, TP, TAC, and sensorial acceptance of the juices. The minimum and maximum values for each pulp fruit were set at 0% (-α) and 20% (+α). All the experiments were carried out in order to have a random selection method to minimize the effect of unexplained variability in the obtained responses due to systematic errors. The analysis of variance (ANOVA) was applied to validate the model, and the regression coefficients were then used to generate response surfaces. The P < 0.05 was considered to be statistically significant. All results were performed using Statistica 7.0. Ascorbic acid content was determined in the fresh fruit pulp and juice formulations by a titration method, based on the reduction of the indicator, 2,6-dichloroindophenol. To TP and TAC analysis, an extract was prepared according with the procedure developed by Larrauri et al. (13): fresh and lyophilized samples from the pretesting stage were weighed (g) in centrifuge tubes and extracted sequentially with 4 mL of methanol/water (50:50, v/v) at room temperature for 1 h. The tubes were centrifuged at 25,400g for 15 min and the supernatant was recovered. Then 4 mL of acetone/water (70:30, v/v) was added to the residue at room temperature, extracted for 60 min and centrifuged. Methanol and acetone extracts were combined, then filled up to 10 mL with distilled water and used to determine TAC and TP. In the total polyphenols analysis, extracts (1.0 mL) were mixed with 1 mL of Folin–Ciocalteu reagent (1:3), 2 mL of 20% sodium carbonate solution and 2 mL of distilled water. After 1 h, absorbance at 700 nm was read in the spectrophotometer. Results were expressed as g of gallic acid equivalents (GAE) 100 g-1 (14). Total antioxidant capacity by the ABTS·+ assay was based on a method developed by Miller et al. (15) with modifications. ABTS·+ radicals were produced by reacting 7 mM ABTS stock solution with 145 mM potassium persulfate and allowing the mixture to stand in the dark at room temperature for 12–16 h before use. The ABTS·+ solution was diluted with ethanol to an absorbance of 0.70 ± 0.02 at 734 nm. After the addition of 30 μLof sample or trolox standard to 3 mL of diluted ABTS·+ solution, absorbance was read at 6 min after the mixing. The results were expressed as μM Trolox g-1. The sensory evaluation of acceptance was carried out with fifty untrained panelists in the laboratory test, using nine-point structured hedonic scales (1: ‘disliked extremely’ to 9: ‘liked extremely’). The order of presentation of the samples followed balanced order. The Project was approved by CEP-UECE ethics committee nº 11044529-5. 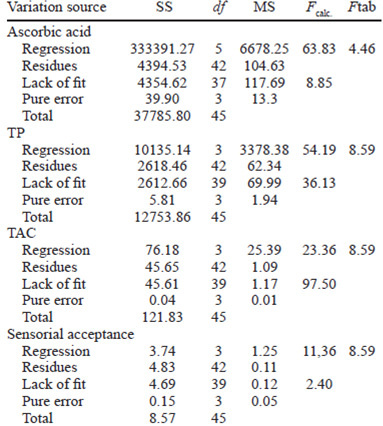 The composition of fruit pulp used in the experiments, in terms of ascorbic acid, TP and TAC, is shown in Table 1. The pulps with higher levels of functional compounds are characterized by acerola > camu-camu > acai > cashew apple > yellow mombin. Table 1. Ascorbic acid, Total Polyphenols (TP) and Total Antioxidant Capacity (TAC) of different tropical fruit pulp (fresh weight). *used in factorial fractional design; **used in CCD. For the ascorbic acid, both statistical planning (fractioned factorial design and CCD) indicate a significant effect for the camu-camu, acerola and cashew apple variables. Analyzing the results at P < 0.10, the cashew apple had a significant effect (24.68) on ascorbic acid content, while the significant effect of camu-camu and acerola was much higher (141.75 and 141.72, respectively). Thus, in the sequential plannining (CCD) at P < 0.05 (see Table 2), the ascorbic acid ranged from 76.84 to 201.91 mg 100 g-1. The results obtained for TP and TAC were similar for the acerola and camu-camu variables, with a positive effect in both statistical plannings. The camu-camu and acerola had a positive effect for TP (66.33 and 67.40, respectively), and mango presented a negative effect (-15.08) in the fractioned factorial statistical planning. Based on these results, mango was excluded for the CCD in order to reduce the number of variables. Among the variables tested in relation to TAC, camu-camu and acerola showed similar positive effects (6.38 and 6.86, respectively). Table 2. 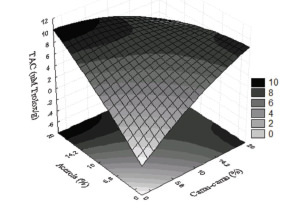 Experimental Design and Results in Response Surface Methodology (RSM) Studies: axial and central points. Independent variables: concentration of pulp used at each CCD level: 0% (-2.38) 5.8% (-1) 10% (0) 14.2% (+1) e 20% (+2.38). The factorial 25 = 32 run, corresponding to +1 and -1 combinations were not shown. The results obtained in the second plannining (CCD) (see Table 2), showed a range of 57.1 to 126.95 mg GAE 100 g-1; and 2.73 to 10.27 μM Trolox g-1 for the TP and TAC responses, respectively. The variables camu-camu, acerola and acai present a additive effect in the TP, and no synergistic or antagonistic effect was observed in this variable. For TAC, an antagonistic effect may be observed between acerola and camucamu. Considering P < 0.05, camu-camu and acerola were statistically significant for both responses, and acai presented effect on TP, although for TAC, its effect can be observed at P < 0.10. In sensory evaluation, considering the effect of each fruit pulp in the acceptance (P < 0.10), only yellow mombin presented a significant positive effect (0.71) and camu-camu a negative effect (-1.62). For CCD, the scores were in a range of 5.2 to 7.1. Table 3. Anova for Response Surface Quadratic Model. Where x1, x2, x3, x4 and x5 are coded variables (see Table 2). The effect of ascorbic acid is described by a second order equation, and a surface plot (Figure 1) was elaborated using acerola and camu-camu, considering that these variables are the most important for this response. Thus, TP is mainly affected by acerola, camu-camu and acai, and it is possible to verify this positive effect in the Figure 2, showing the interaction between camu-camu and acai. Considering the TAC, the results indicated that acerola and camu-camu presented a positive effect, and an antagonism between these variables can be observed (Figure 3). Figure 1. 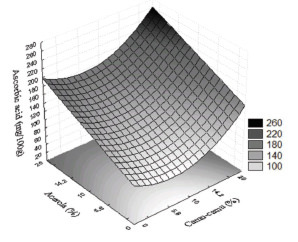 Surface plot of the Ascorbic Acid content as function of camu-camu and acerola concentration. Figure 2. Surface plot of the TP (Total Polyphenols content as function of camu-camu and acai concentration. Figure 3. 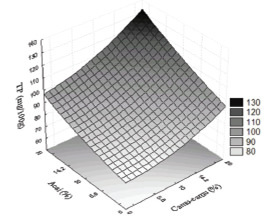 Surface plot of the TAC (Total Antioxidant Capacity) as function of camu-camu and acerola concentration. The camu-camu and acerola pulps presented the higher levels of functional compounds, as shown in Table 1, and the influence of these fruits can be viewed in both statistical planning, where they represent the variables with the high effects in ascorbic acid, TP and TAC. By analyzing the results obtained, it was possible to determine the effects and the synergistic/antagonistic interactions between the studied variables, and to define a valid model using the statistically significant variables. The effects of each statistically significant variable are completely comprehensible since the literature reports that camu-camu, acerola and cashew apple are the richest sources of vitamin C (16). Therefore, the incorporation of camu-camu, acerola and cashew apple, at the levels tested in this work, was fundamental to obtain a beverage with high levels of this vitamin, as suggested by some authors (17). The results obtained for total polyphenols (TP) and total antioxidant capacity (TAC) were similar for the acerola and camu-camu variables, with a positive effect in both statistical plannings. For acai, no effect was observed, although several studies have demonstrated that the acai exhibits high antioxidant capacity due to the high polyphenols content (3, 18). A hypothesis for this discrepancy is based on the quality of the pulp used in the first experiment. According to Souza et al. (3), in the acai pulp extraction process, the addition of water may contribute to the differences in the levels of polyphenols. Based on this fact, before starting the CCD, some commercial acai pulps were analyzed (data not shown), and a pulp with 279.30 mg 100 g-1 of TP, almost two times more (see Table 1) than that used in the first planning, was selected to be used in the CCD, resulting, as expected, in a significant effect. 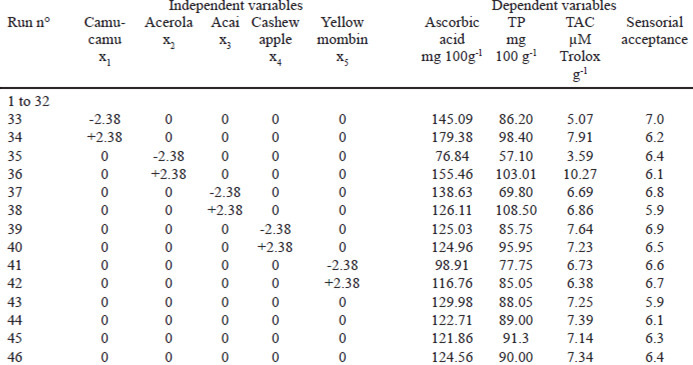 The results obtained in the second plannining (CCD) (see Table 2), showed the variables camu-camu, acerola and acai with an additive effect in the TP, and no synergistic or antagonistic effect was observed. For TAC, an antagonistic effect was observed between acerola and camu-camu. Considering P < 0.05, camucamu and acerola were statistically significant for both responses, and acai presented effect on TP, although for TAC, its effect can be observed at P < 0.10. Some studies suggest a positive and significant correlation between TAC, ascorbic acid and TP, being that TP is considered the most important factor to improve the TAC values (17, 5). According to the references, the camu-camu, acerola and acai are important sources of phenolic compounds. Recently, Chirinos et al. (16) found high levels of phenolic compounds in camu-camu pulp, with an average of 1286 mg GAE 100 g-1 of fresh matter. Akter et al. (19) reviewed the nutritional composition and health promoting phytochemicals of camu-camu and concluded that it might be used as a functional food or for nutraceutical purposes. Rufino et al. (5), evaluated bioactive compounds and the antioxidant capacity of 18 nontraditional tropical fruits from Brazil, and obtained values of fresh matter of 1176 mg GAE 100 g-1 for camu-camu, and 1063 mg GAE 100 g-1 for acerola. For TP, the authors suggested three categories of fruits: low (< 100 mg GAE 100 g-1), medium (100-500 mg GAE 100 g-1) and high (> 500 mg GAE 100 g-1), and considering this classification, camucamu and acerola can be considered fruits with high concentrations of phenolic compounds. Although acai is considered as medium, the value obtained for this fruit (454 mg GAE 100 g-1) can be considered close to the limit of fruits considered with a high content of polyphenols. Abreu et al. (20) evaluated mango, passion fruit and cashew apple as components of beverages rich in bioactive compounds. The results obtained range from 51.70 to 62.59 mg GAE 100 g-1, significantly lower than that found in our work. However, using acerola, pineapple and green coconut water, Pereira et al. (17) obtained values of TP of 150.79 ± 6.92 mg GAE 100 g-1 in concentrations of 20%, 15% and 65%, respectively. The authors suggest that the acerola showed an important role for TP values of the beverages. This was in agreement with those observed in the statistical planning of this experiment, where acerola and camu-camu represented the variables with the highest contribution for the response TP and, consequently, TAC. As mentioned before, the effect of acerola and camu-camu were positive (P < 0.05) for both responses (TP and TAC), although a negative effect may be observed in the interaction between camucamu and acerola only for TAC. Several hypotheses have been developed to explain synergistic and antagonistic effects of antioxidant combinations (21). However, Wang et al. (9) suggest that the majority of investigations are still limited to in vitro tests on purified antioxidant mixtures, different compounds in a specific food, or similar foods within the same fruit or vegetable categories. It was not clear as to how the phytochemicals in these studies interact with each other and how the interactions lead to synergistic effects. More work is needed to investigate the possibles causes of the antagonism among camu-camu and acerola. However, we suggest two possibilities to explain this result: an antagonistic interaction between certain mixtures of polyphenols; the prooxidant action of ascorbic acid at a higher concentration (22), or it could be caused by both. The sensory evaluation results showed a positive effect for the use of yellow mombin and a negative effect for camu-camu, in the fractional design. However, camu-camu was important to improve the antioxidant capacity, phenolic and ascorbic acid contents of the tropical juice. In the CCD, the results were positively influenced by yellow mombin, while the use of larger amounts of camu-camu decreases the acceptance. This result is in agreement with the results obtained by Souza-Filho et al. (21), which showed low acceptance of nectar composed of high content of camu-camu, in contrast with yellow mombin, that showed high sensorial acceptance. Vidigal et al. (2) evaluate the sensorial acceptance of four exotic tropical fruit juices (acai, camu-camu, yellow mombin and umbu) through internal preference mapping and the cajá and umbu juices showed higher sensory acceptance and the camu-camu juice had the highest sensory rejection. Some authors suggest that the camu-camu consumption is still restricted due to its high acidity, bitterness, and skin astringency, thus needing the use of proper technologies for processing (4). Nevertheless, the contribution of camu-camu in the levels of bioactive compounds is clear, and this fruit can be associated with other fruits to improve its sensory acceptance. The equations and surface plots describes the synergistic or antagonistic effects of mixed fruit juices. The effect of ascorbic acid is described by a second order equation, and a surface plot (Figure 1) was elaborated using acerola and camu-camu, considering that these variables are the most important for this response. Thus, TP is mainly affected by acerola, camu-camu and acai, and it is possible to verify this positive effect in the Figure 2, showing the interaction between camu-camu and acai. Considering the TAC, the results indicated that acerola and camucamu presented a positive effect, and an antagonism between these variables can be observed (Figure 3). Studies on diet patterns give an indication of what nutrients are beneficial to health. According to Saura-Calixto et al. (12), in the Mediterranean dietary pattern, the total antioxidant capacity (TAC) of the overall diet is 3500 to 5300 trolox equivalent per person per day, together with fatty acid ratio, phytoesterols and the dietary fiber intake. The intake of these compounds is strongly linked with consumption of fruits, vegetables and whole grains. Hervert-Hernández et al. (24) determined an average daily intake of polyphenols higher than 800 mg/day, and 1000 to 2000 μM Trolox eq per day. Due to practical reasons, based on the results of TAC, TP and ascorbic acid found in this investigation, the use of 20% acerola, 10% camu-camu, 10% yellow mombin, 10% cashew apple and 10% acai was established, responsible for 177.18 mg 100 g-1 of acid ascorbic, 120.30 mg GAE 100 g-1 of TP and 8.64 μM Trolox g-1 of TAC (predictive results). Although the F value and R2 for sensorial acceptance are not adequate for the statistical model, it is important to observe that all the beverages tested in this work have acceptance scores above 5. The optimized beverage is able to supply in one package (200 mL) nearly 50% of the daily intake of antioxidant compounds recommended by Saura-Calixto et al. (12) and, in addition, is rich in ascorbic acid, polyphenols compounds and has a good acceptance. Based on the results of the fractioned planning and the central composite design, the concentration of camu-camu, acai, acerola, yellow mombin and cashew apple have significant effects on the total phenolic (TP), total antioxidant capacity (TAC), ascorbic acid and acceptance of the fruit juices. The use of surface plots in RSM was effective for estimating the effect of the fruit pulps on the ascorbic acid, TP and TAC variables, and investigates the interations (antagonism, additive or synergism) among these fruits. The optimum set of the independent variables was obtained graphically in order to obtain a juice with a high content of polyphenols, antioxidant capacity, ascorbic acid and a good acceptance. A daily consumption of 200 mL of the tropical juice composed of 20% acerola, 10% camu-camu, 10% yellow mombin, 10% caju and 10% acai is responsible for approximately 50% of the amount of antioxidants recommended by the Mediterranean pattern diet, therefore being a rich source for these bioactive compounds. The authors are grateful to Brazilian Agricultural Research Corporation (EMBRAPA) and National Council for Scientific and Technological Development (CNPq) for their financial support and to the Coordination for the Improvement of Higher Level -or Education- Personnel (CAPES) for providing a Doctoral scholarship for the first author. Siró, I., Kápolna, E., Kápolna, B. & Lugasi, A. Functional food. Product, development, marketing and consumer acceptance – a review. Appetite. 2008. 51: 456-467. Vidigal, M.C.T.R., Minim, V.P.R., Carvalho, N.B., Milagres, M.P. & Gonçalves, A.C.A. Effect of a health claim on consumer acceptance of exotic brazilian fruit juices: açaí (Euterpe oleracea Mart. ), camu-camu (Myrciaria dubia), cajá (Spondias lutea L.) and umbu (Spondias tuberosa Arruda). Food Res Int. 2011. 44: 1988-1996. Souza, M.C., Figueiredo, R.W., Maia, G.A., Alves, R.E., Brito, E.S., Moura, C.F.H. & Rufino, M.S.M. Bioactive compounds and antioxidant activity on fruits from different açaí (Euterpe oleracea Mart) progenies. Acta Hort. 2009. 841: 455-458. Maeda, R.N., Pantoja, L., Yuyama, L.K.O. & Chaar, J.M. Determinação da formulação e caracterização do néctar de camu-camu (Myrciaria dubia McVaugh). Ciênc Tecnol Aliment. 2006. 26: 70-74. Rufino, M.S.M., Alves, R.E., Brito, E.S., Perez-Jimenez, J., Saura-Calixto, F., Mancini-Filho, J. Bioactive compounds and antioxidant capacities of 18 nontraditional tropical fruits from Brazil. Food Chem. 2010. 121: 996−1002. Genovese, M.I., Pinto, M.S., Souza, S.G.A.E. & Lajolo, F.M. Bioactive compounds and antioxidant capacity of exotic fruits and commercial frozen pulps from Brazil. Food Sci Tech Int. 2008. 14: 207–214. 126 da Silva et al. Tiburski, J.H., Rosenthal, A., Deliza, R., Godoy, R.L.O. & Pacheco, S. Nutritional properties of yellow mombin (Spondias mombin L.) pulp. Food Res Int. 2011. 44: 2326–2331. Liu, R.H. Health benefits of fruit and vegetables are from additive and synergistic combinations of phytochemicals. Am J Clin Nutr. 2003. 78: 517S-520S. Wang, S., Meckling, K.A., Marcone, M.F., Kakuda, Y. & Tsao, R. Synergistic, additive, and antagonistic effects of food mixtures on total antioxidant capacities. J Agric Food Chem. 2011. 59: 960–968. Jo, M.S., Rene, E.R., Kim, S.H. & Park, H.S. An analysis of synergistic and antagonistic behavior during BTEX removal in batch system using response surface methodology. J Hazardous Materials. 2008. 152: 1276–1284. BRASIL. 2003. Ministério da Agricultura Pecuária e Abastecimento. Instrução Normativa Nº 12, de 4 de setembro de 2003. Aprova o regulamento técnico para fixação dos padrões de identidade e qualidade gerais para suco tropical. Diário Oficial da União, Brasília, 09 de setembro de 2003. Saura-Calixto, F. & Goñi, I. Definition of the mediterranean diet based on bioactive compounds. Crit Rev Food Sci Nutr. 2009. 49: 45–152. Larrauri, J.A., Rupérez, P. & Saura-Calixto, F. Effect of drying temperature on the stabilitity of polyphenols and antioxidant activity of red grape pomace peels. J Agr Food Chem. 1997. 45: 1390-1393. Obanda, M. & Owuor, P.O. Flavonol composition and caffeine content of green leaf as quality potential indicators of Kenyan black teas. J Sci Food Agric. 1997. 74: 209-215. Miller, N.J., Diplock, A.T., Rice-Evans, C., Davies, M.J., Gopinathan, V. & Milner, A. A novel method for measuring antioxidant capacity and its application to monitoring the antioxidant status in premature neonates. Clin Sci. 1993. 84: 407-412. Chirinos, R., Galarza, J., Betalleluz-Pallardel, I., Pedreschi, R. & Campos, D. Antioxidant compounds and antioxidant capacity of Peruvian camu-camu (Myrciaria dubia (H.B.K.) McVaugh) fruit at different maturity stages. Food Chem. 2010. 120: 1019–1024. Pereira, A.C.S., Siqueira, A.M.A., Farias, J.M., Maia, G.A., Figueiredo, R.W. & Sousa, P.H.M. Desenvolvimento de bebida mista à base de água de coco, polpa de abacaxi e acerola. Arch Latinoam Nutr. 2009; 59: 441-447. Hassimotto, N.M., Genovese, M.I. & Lajolo, F.M. Antioxidant activity of dietary fruits, vegetables, and commercial frozen fruit pulps. J Agric Food Chem. 2005. 53: 2928-2935. Akter, M.S., Oh, S., Eun, J.B. & Ahmed, M. Nutritional compositions and health promoting phytochemicals of camu-camu (Myrciaria dubia) fruit: A review. Food Res Int. 2011. 44: 1728-1732. Abreu, D.A., Silva, L.M.R., Lima, A.S., Maia, G.A., Figueiredo, R.W., Sousa, P.H.M. Desenvolvimento de bebidas mistas à base de manga, maracujá e caju adicionadas de prebióticos. Alim Nutr. 2011. 22: 197-203. Freeman, B.L., Eggett, D.L. & Parker, T.L. Synergistic and antagonistic interactions of phenolic compounds found in navel oranges. J Food Sci. 2010. 75: 570-576. Yen, G., Duh, P. & Tsai, H. Antioxidant and prooxidant properties of ascorbic acid and gallic acid. Food Chem. 2002. 79: 307-313. Souza-Filho, M.S.M., Lima, J.R., Nassu, R.T., Borges, M.F. & Moura C.F. Avaliação físico-química e sensorial de néctares de frutas nativas da região Norte e Nordeste do Brasil: estudo exploratório. Braz J Food Tech. 2002. 5: 139-143. Hervert-Hernández, D., García, O.P., Rosado, J.L. & Goñi, I. The contribution of fruits and vegetables to dietary intake of polyphenols and antioxidant capacity in a Mexican rural diet: Importance of fruit and vegetable variety. Food Res Int. 2011. 44: 1182–1189.